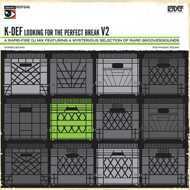 "Looking For The Perfect Break Volume 2" is a nearly 40 minute mixtape on vinyl by DJ K-Def. If you’re familiar with his "Perfect Break Volume 1", you know what to expect here. If this is your first time hearing a K-Def mix, do not expect to hear the same old sounds that you often hear on break mixes. Instead, K is showing off some of his personal favorites including many impossible to find sounds and rare grooves from his vast record collection, mixing in and out of songs at a rapid pace. This record is a must have for folks who appreciate good music as well musicians/producers seeking new sounds and inspiration.